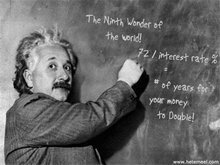 Albert Einstein called “The most powerful force in the universe is compound interest” because of its amazing abilities. Essentially, compounding is the idea that you can make money on the money you’ve already earned. If you invest Rs 1000 for 50 years at a 10% return that does NOT compound, you will receive Rs 100 per year for 50 years. At the end of the 50 years, you would have 6,000 (the Rs 1,000 investment + 5,000 in interest). Now, if you invested that Rs 1000 for 50 years at a 10% return that DOES compound, you would have Rs 117,390! As you can see, compounding has a lot of value to investors. It makes their money grow a lot faster than it would if it didn’t compound. Compounding is also highly dependent on when you start investing and the smallest differences in when you start can make a big difference when you retire. Participatory Notes(PNs) — Whole system need to be cleaned ! Next post: Guess WHO ?